The era of energy dinosaurs is coming to an end | Grist: "The value of a solar rooftop in a world of electric vehicles is very different from the value of the same solar rooftop in a world without." Federally Funded Chevy Volt Battery Plant Paid Workers to Play, Not Make Batteries | Wired Business | Wired.com: "It was supposed to be the center of a resurgent domestic lithium ion battery industry. A shiny new factory in Holland, Michigan, that by the end of 2013 would produce enough energy cells to power 60,000 electric or hybrid electric cars — and the Chevy Volt would be its highest-profile customer. Instead, after spending $142 million of a $151 million federal Recovery Act grant to set up the factory, LG Chem Michigan has yet to produce a single battery cell that can be used in an electric car sold to the public. It gets worse. Two of five planned production lines remain unfinished. And rather than the 440 jobs the plant was supposed to create, less than half exist today. But what jobs." House Bill 2453, which received its first public hearing on Monday, would apply a per-mile fee to vehicles that get 55 miles per gallon or better efficiency that are produced in 2015 or thereafter." Should electric cars pay a per mile tax? | Politics | Eugene News, Weather, Sports, Breaking News | KVAL CBS 13: "Kirk Gebb owns an all-electric Nissan Leaf. Gebb doesn't buy any gas, which means he doesn't pay any gas tax. "I just don't understand why more people don't adopt this," Gebb said. "Just so much more efficient than any gas vehicle is. It makes sense."" Is it Fair for States to Charge Hybrid Drivers Mileage Fees? Is it Fair for States to Charge Hybrid Drivers Mileage Fees? : "Oregon lawmakers are considering a bill that would tax fuel-efficient drivers whose vehicles get 55 miles per gallon or more beginning in 2015. Oregon’s testing is comprised of calculating miles driven within predetermined parameters (i.e. in the state and not including private roads) with the assistance of a GPS device. The concept involves tracking travel data of hybrid vehicles within the state, and reporting that data to receivers at the pump. The state’s second pilot program included 50 participants, according to the Associated Press, and charged 1.56 cents for every mile driven." RIT professor wins award to study recycling batteries from electric cars | Democrat and Chronicle | democratandchronicle.com: "“If we don’t take a proactive approach to understand when and in what quantities these batteries might enter the waste stream, then we have the potential for a major waste challenge down the road,” Babbitt said. “There are many unknowns when it comes to understanding the environmentally responsible way to recycle or recover this type of waste.”"
Tesla: 100% Market Share in Silicon Valley - TheStreet: "There are over 300 million people in this country, and there are over 15 million cars sold per year in the U.S. Even at 15,000 cars per year, Tesla would constitute only 0.1% of the U.S. new car market. Obviously, an even smaller percentage of the cumulative stock of cars on the roads. Here's the thing, though: This is still very early days for Tesla. It's like judging the prospects of the iPhone based on how many people bought the iPhone on that first day in June 2007." In 1919, Oregon was the first state to institute a gasoline tax. Today every state has one and there's even an 18.4¢ federal tax on each gallon. The average state tax is currently 30.4¢ per gallon. Adding the federal tax, on average we're paying 48.8¢ of taxes per gallon. There has been concern lately that this tax revenue will evaporate as more fuel efficient vehicles come out. The new 54.5 MPG Corporate Average Fuel Economy (CAFE) target and the highly publicized plug-in vehicle have doomed road funding. All-electric cars use no gasoline and, therefor, never pay gasoline taxes. From this cursory analysis, it seems like there is a real need to replace the gasoline tax, lest our potholes will never be filled and our bridges will collapse. Oregon, Washington, Indiana, Virginia, Texas, and others are considering special taxes for fuel efficient and electric vehicles. Is this cursory analysis correct? Let's look a little deeper. Since Oregon was the first state with a gas tax and will likely be a bellwether to new strategies, let's look at Oregon in detail. How Does Oregon Pay for Roads? Oregon's state gas tax is 30¢ per gallon, about the same as the national average. Although, many cities and counties tack on their own small tax. The Oregon gas tax law requires that the money collected from this tax is used for transportation infrastructure. This tax, however, is not the only source of road funds. A recent report from the Tax Foundation showed that in Oregon, the gas tax and registration fees (collectively called road user fees) only make up 21.8% of our road funding. The other 78.2%, the bulk of the funding, comes from property taxes, income taxes, and the state's general fund. This is similar to others states'; road user fees are generally one third or less of the road funding source. What Will the CAFE Impact Really Be? When the new 2025 CAFE target was announced, there were numerous headlines about this "radical step". If you have watched the US fuel efficiency stagnate since the '80s (as you can see in the image above), you may wonder how this is possible. Truth be told, a new car won't have to get 54 MPG. To meet the magic CAFE target the vehicle will only need to achieve about 36 MPG. Why? 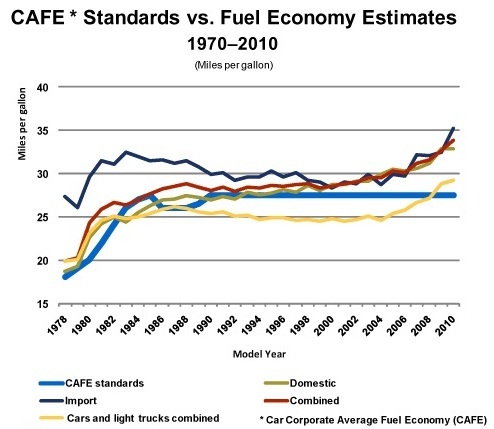 The explanation has been detailed in Scientific American and other articles but the short answer is because the fuel economy window stickers and CAFE are calculated in different ways. Window sticker testing is much more difficult. It is based on five tests including hot weather, cold weather, air conditioning use, and higher speeds. 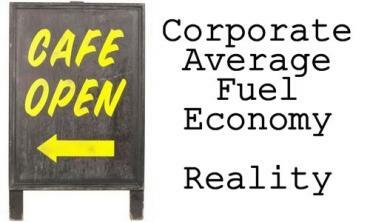 Since their inception, window sticker fuel economy has always been lower than the same car's CAFE rating. For the 2016 CAFE target of 34.1 MPG, a vehicle needs only a 26 MPG window sticker. Will Plug-in Cars Leave Gas Stations Empty? Plug-in vehicles have been getting a lot of media attention, both good and bad. This might lead you to believe that they will sweep the market and by next week tumble weeds will be the only thing at the corner gas station. This is far from the truth. Hybrids have been available in the US since 2001. They currently account for only 3% of new car sales. Even if plug-in cars doubled this adoption rate, they would not be a significant amount of the national fleet; certainly not enough to build a significant tax fund base on. From the day a car drives off the dealer lot with shiny paint and that new car smell, it will be on the US roads for an average of 12 years. 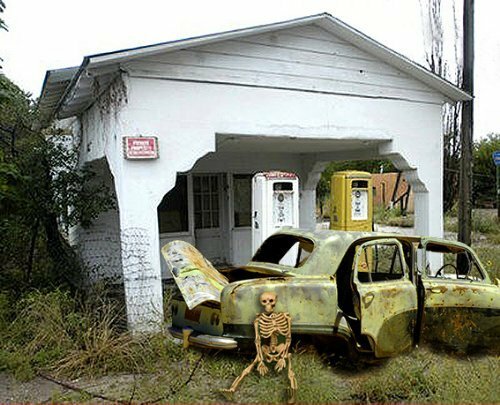 Given the slow rate at which new technology is taken up by the auto buying populous and the average vehicle lifespan, you can expect most vehicles on the road, even 20 years from now to be making weekly stops at the gas station to fill up. Are Plug-in Cars Dodging Their Fair Share? One of the aspects of Oregon's current mileage based proposal is that it is only levied against vehicles that get 55 MPG or greater and all-electric vehicles. Since these vehicles use little or no gas, this seems to be the right vehicles to target, but there are two flaws in targeting this small class of vehicles. Fuel efficient cars and plug-in cars use the roads too, they should pay for them just like everyone else. As we discussed above, but bulk of Oregon's road funding (78.2%) comes from the general fund. All-electric drivers are paying some for roads. And they are paying for the electricity that they use. Next time you get your electricity bill, flip it over and look at the long list of taxes and fees included. However, there is a bigger problem. If the state enacts a tax for a small percentage of vehicles, it will have nearly all the same overhead of establishing rules and collection methods regardless of the scope of the vehicles included. A program that applies to 3 million vehicles will be more efficient than one that applies to 60 thousand. If Oregon really is concerned about declines in revenue from the gas tax, the fair option would be to replace it with a mileage tax for all vehicles. This would be a fair tax that does not discriminate base on fuel type or efficiency. The road does not wear differently based on the fuel source, neither should the tax rate. 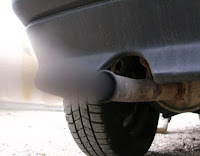 For years, the federal government (and many state governments) have provided financial incentives for fuel efficient vehicles and the gas tax was (in addition to the fuel cost) a penalties to those who profligate gasoline use. It is in our national interest to decrease pollution and our entanglement in the Middle East. A tax specifically targeting the very vehicles that are helping to meet these goals, is a bureaucratic roadblock that we do not need. It creates a disincentive to buy plug-in and fuel-efficient cars, a disincentive to meeting very important national goals. The use of plug-in vehicles benefits all of us, regardless of who is driving them. The Union of Concerned Scientists conducted a study that showed there are air quality benefits to plug-in vehicles even when they are charged up on the dirtiest grid sectors in the country. When renewables are used these benefits are even better. Here in Oregon, we have a significant amount of hydro and wind power. This means that every mile driven by a plug-in car will pollute the air less (much less) than a gasoline car. Additionally, each gallon of gas that plug-in drivers don't buy is one more that is available to those that do want to use gasoline. Maybe this will help gas prices stay under $5 a gallon a little longer. So while the plug-in driver might be the only one surrounded by a cloud of smug, they help all of us avoid smog. Is There a Need to Replace the Gas Tax? Given the first point, fluctuations in gasoline use due to vehicle fuel economy advances (or anything else) will only impact a small part of road funding. Points two and three can be summed as: changes in fuel use patterns will be gradual. Together these reduce the urgency of a new tax method. While I appreciate Oregon's innovative thinking, they have begun looking for a solution to a problem that does not yet exist. Adding a new tax on a very small minority of vehicles will not solve budget short falls caused by people making less and driving less during economic downturns such as the Long Recession that has increasing strangled government funding. If Oregon (and other states) wants to replace the gas tax, they should be looking for a method to replace it for all passenger vehicles, so as not to reverse the many efforts to encourage these vehicles. A vehicle mile tax that, for example, applied to all cars model year 2016 and newer would allow the program to phase-in while not reducing the sales of efficient vehicles. As the title suggests, there are more posts to come on this topic. We'll discuss the specifics of Oregon's proposed and how it could be improved. Free Electricity Is Problematic for Electric Cars | PluginCars.com: "There's something great about gasoline: the business model. Oil companies are making fat profits, and small shops take a fair cut when they sell gasoline to drivers. This is one of, if not the most, successful businesses there is. 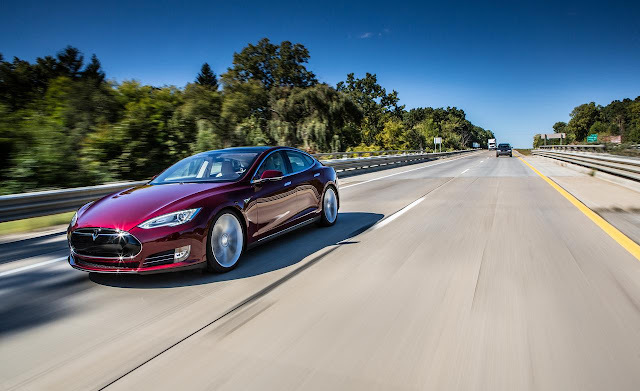 It has been consistently profitable for more a 100 years"
After being given a Tesla Model S to test drive, John M Broder drove it until it was empty and then proclaims that EVs must just be a California thing. Here is the valuable lesson he learned: (News Flash) If you ignore the fuel gauge and all the warnings, and just keep driving, you will eventually hit empty. Wow, this same thing applies to any vehicle with any fuel type! I guess John thought that Tesla had invented a perpetual motion machine. From the article: “It takes more planning than a typical gasoline car, no way around it." Au contraire, you plug EVs in at your house, let it charge while you sleep, and for a typical day's drive, you never have to stop anywhere. Would you find it "convenient" to take your cell phone to a filling station periodically? No, of course not. Plugging in at your house and charging overnight is for more convenient and it does not require much planning. "Reuters--"Electric Cars Head Toward Another Dead End"--or a weekend report in The Detroit News entitled "Electric Vehicle Sales Sputter." Yes, the optimistic predictions of plug-in electric cars sales made by manufacturers two or three years before production and sales began have not been met. Yes, electric cars will be a small portion of the market for several years to come. Yes, battery-electric cars may be a smaller portion of the total than range-extended electrics and plug-in hybrids for years to come as well. None of that negates the growth in sales: From a modest first-year level of about 17,500 plug-in electric cars sold in the U.S. in 2011, sales tripled last year." Will 2013 Nissan Leaf Price Cut Cause Sales To Soar? : "We think sales will rise--depending in part on what incentives Nissan provides on the new U.S.-built Leaf--but that they won't soar into the stratosphere. Pike Research agrees." Demand For 100% Electric-Powered Cars Is So Low, Toyota Has Basically Given Up On Them: "Just as new electric plug-in vehicles are hitting the U.S. market, Japanese auto giant Toyota Motor Corporation (TYO:7203) has given the strongest signal yet that technology available today has greater potential to become the future of driving than battery-operated cars have ever been: hydrogen power. Demand for these vehicles has been as slow as a golf cart on a nearly depleted battery, so slow in fact that Energy Secretary Steven Chu indicated last week that the White House’s goal of 1 million electric vehicles on American roads by 2015 was “ambitious,” an indication that reality has set in on previously optimistic forecasts." Austin Energy surpasses 10,000th plug-in charge at public stations | KXAN.com: "Drivers of plug-in electric vehicles this month surpassed their 10,000th charging session using Austin Energy’s Plug-In EVerywhere network of charging stations, saving 7,363 gallons of gasoline. In terms on money, this means about $24,000 in gas money saved for motorists based on $3.25 per gallon of gasoline."